Although Edwin Jackson was considered to be the major grab for the Arizona Diamondbacks in the three way trade involving Max Scherzer, Curtis Granderson, and Austin Jackson, the Diamondbacks certainly considered Ian Kennedy to be a large piece of their future as well. Kennedy has a 4.22 ERA, 4.60 FIP, and a 4.32 xFIP, so he’s performed roughly as an average pitcher. At age 25, there’s certainly room to improve, but one has to think that the Diamondbacks will expect more out of Kennedy as his career goes on. Games like yesterday’s against the Padres suggest that Kennedy has top half of the rotation potential. Kennedy threw seven shutout innings against San Diego, allowing only one hit and two walks while striking out a whopping 12 batters. Only nine of the 24 batters faced by Kennedy even managed to put the ball in play, and four of them put the ball on the ground. Even though it was in cavernous PETCO Park, it’s hard to classify this outing as anything but dominant. As we dive deeper, we continue to see impressive numbers out of Kennedy’s start. Kennedy threw 62 strikes in 105 pitches (59%), drew 16 swinging strikes (15.6%), and was above average with every single one of his five pitches according to pitch type linear weights. Particularly impressive was Kennedy’s changeup, which he threw 16 times. Twelve of them went for strikes, and a ridiculous 8 – half of them! – resulted in swings and misses. 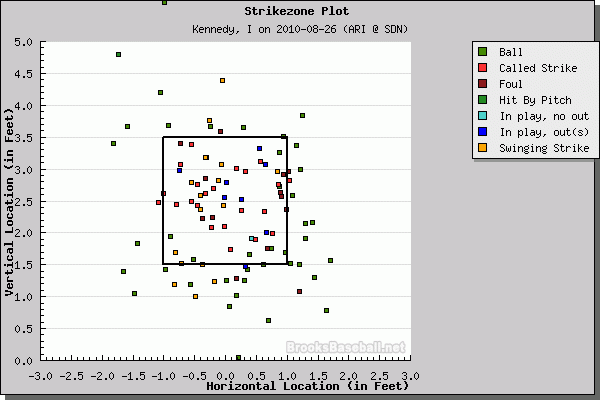 Kennedy was drawing swings and misses both at the edges of the zone and down the middle, as this plot from Brooks Baseball shows. Some may be quick to dismiss a start against the Padres in PETCO Park, but we can’t do that this year. The Padres offense has been above average this year, and that’s prior to additions such as Ryan Ludwick and Miguel Tejada. In the post-Dan Haren era, the Diamondbacks will need production from other SPs in the system. Expecting Kennedy to become another Dan Haren is a pipe dream, but with performances like this as well as Daniel Hudson’s strong showings with his new team, the Diamondbacks have two young starting pitchers who should form the core of a solid starting rotation for a few years to come. We hoped you liked reading A Flash of Brilliance From Kennedy by Jack Moore!